With the advent of heart failure, significant changes imprint its underlying pathology and distort the normal left ventricular architecture leading to perturbations in ventricular function. The early changes of increased spherical configuration lead to impairment of ventricular function during exercise and may lead to exercise-induced functional mitral regurgitation. With advanced heart failure, extensive ventricular remodeling occurs when only pharmacological therapy may not suffice. Therapy in these scenarios will require an extensive armamentarium of devices and nontransplant surgeries. 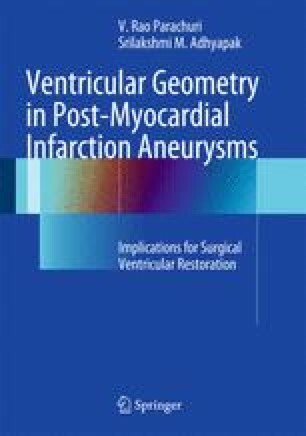 This chapter deals with the perturbations in cardiac anatomy following transmural myocardial infarctions and aneurysm formation. The intrinsic myofiber orientations are distorted with ventricular wall thinning and fibrosis, replacing portions of the ventricular wall. The cellular mechanisms involved in the remodeling process have also been detailed.